John Calvert worked from 1791 until his death in 1822, after which his widow Dorothy took over until her death in 1840. He is one of the top chess set makers, well known of his beautiful Knights. This very early set is historically interesting because the Knights are in the 18th century manner instead of the later carved Knights. The long thread that connects the head to the stem is also seldom seen. Normally, Knights in such sets are monoblock or connected with a pin. It is almost certainly that the wooden set has been made by Calvert, although it is not signed and came with a box like those of Hezekiah Dixon. Most remarkable are the exceptionally well carved Knights, which are made of one piece of wood here. A feature seldom seen in wooden "St.George" type sets. Box signed "CALVERT 189 FLEET STT"
Knights are made of one piece of wood! George Merrifield is maybe the best turner of his time. His chess sets are outstanding in precision and beauty. As far as I know are all "Merrifield" sets actually made by George Merrifield and not by other manufacturers. George Merrifield worked from about 1819 till his dead in 1855. "Lund" type sets are called after chess sets made by father Thomas (early 1800's until his death in 1843) and son William (throughout the rest of the 19th century) Lund, Cornhill London. We have seen signed sets of both. This type was very popular and has been made by several other manufacturers. 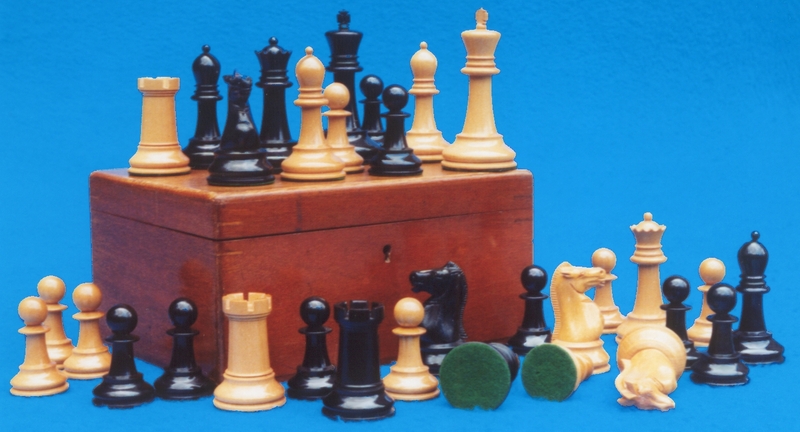 "Lind/Fisher" type chess sets are recognized by the open worked crowns of the King and Queen. Typically these sets are of large size. The box of this set is small and high, which could be the original box. Sorry, I have no picture of the box yet. The sets were most likely made by William Lund, although Samuel Fisher is listed as an Ivory Turner in the mid-1860's, so he could have made these sets as well. (John) Jaques is probably the most successful maker. At least longest existing, from 1795 till the present day. Most famous, of course, is the "Staunton" pattern, which was patented on March 1, 1849, by Nathaniel Cook, 198 Strand, London. Cook was the brother in law of Jaques. But a lot of other chess set patterns was found in their famous pattern book: "Barleycorn", "Calvert type", "Dublin", "Edinboro Upright", "St.George", etc. Jaques did invent and make a whole lot of other type of games as well and is still in business today. Here 2 Jaques "Staunton" sets. There are a lot of other makers or retailers, like Asprey, J.Barr, BCC, B&C, De La Rue, H.Dixon, C.Hastilov, W.Howard, Wedgwood, R.Whitty, to name a few. I do not have examples of all of these makers/retailers, but you can find some of them elsewhere on my site. Here a "Staunton" set of an unknown maker and a B&C "Staunton" example. England, by B&C London, "Staunton"
Boxwood + ebony K 7.4; p 4. F.H.Ayres. The business and factory of Frederick Henry Ayres, manufacturer, was situated at 111 Aldegate, London, from 1864. Here is a later "Staunton" example. I have several F.H.Ayres sets of different types, which you can find at other England pages. 20th century makers Mildred Rose and Britain made lead sets based on the "Staunton" design. You find them on "The Rose Chess" and Britain pages. On the Plastic page more "Staunton" sets of manufacturers like Grays of Cambridge and House Martin.